After lunch, we walked down to the the project site for the 222 2nd Avenue office tower being put up by JE Dunn Construction. Since many of us originate from the Chicago and/or Illinois area, the JE Dunn name was new for us. However, JE Dunn is one of the largest building contractors in the United States, ranking number 22 on the ENR list of Top 400 Contractors and doing $2.7 billion in annual revenue. The company has rapidly expanded since starting in Kansas City in 1924 by purchasing smaller construction companies in the 1990s and early 2000s, including the Nashville area office. We were able to learn a lot by talking to the project team about how the company operates and their culture compared to other companies we have been accustomed to. A large component of JE Dunn?s culture is their ESOP (employee stock ownership) system. 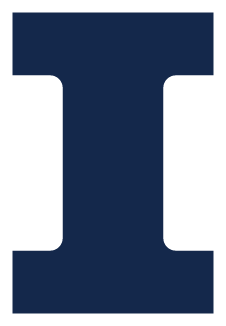 By having employees financially bought in it creates a philosophy of being totally invested in the work and finding new innovations. The company heavily promotes technological advances such as BIM usage for coordination and estimating, digital document control and drawing updates, and on-site WiFi stations to makes sure everyone on the project is building off of the same up-to-date information. The company is generally young and prides itself on the strong relationships between coworkers and clients, having about 90% of their work from repeat customers. 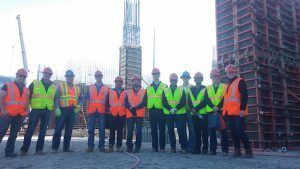 After an introduction our hosts, Tony Simonetta; Project Manger, Sean Buck; Vice President, and Bill Doling; Senior Superintendent, took us on a tour of the job-site for the $88 million 26-story mixed use office tower being constructed for Hines, a major development firm. The building consists of first floor retail, parking on floors 2-11, an amenity deck with a view overlooking the adjacent amphitheater, and office space on the remaining floors. Construction began in November 2015 and will last for 22 months. The building is an entirely cast-in-place concrete structure with drilled pair foundations to bedrock and post-tensioned beams. The site includes a 227 foot blue tower crane that will eventually reach 320 feet. Currently the site is just reaching the above-foundation stage with the first structural walls and columns being formed and poured. The site is also very compact at 46,000 SF for a 44,000 SF building footprint, forcing all material for the the superstructure and exterior metal panels and unitized curtain wall to be hoisted straight off the delivery trucks to the installation point or floor. Bill, Sean and the rest of the JE Dunn team taught us about the various challenges to working on this site and in the Nashville area in general. One of the biggest challenges that we have also heard about on our previous visits is the lack of available workforce in Nashville. This is due to the rapid amount of expansion taking place in the city over the past few years. Since the area, like much of the southern U.S., is open-shop, contractors cannot simply call a union hall to find experienced, trained workers. Instead companies are forced to find and evaluate workers themselves. It is often difficult to find not only the necessary amount of labor but also labor with the right experience and training. Another aspect of this culture is that the very strong union presence we have all been used to in the Chicago area is much more relaxed with union and open shop labor working side by side. 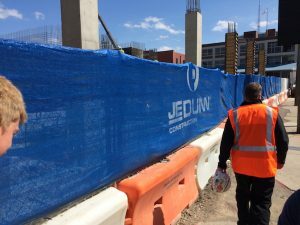 This rapid expansion was evident on the JE Dunn site, which was surrounded by multiple neighboring construction sites. This density required the crane operators to coordinate with each other and share radio signals to be able to communicate about adjacent loads and avoid clashes. Since the city was not set up for the level of construction and expansion currently being experienced, traffic is another major challenge. Since roads cannot be closed during the day and the streets are too narrow to accommodate a major concrete pour, all major pours will be done from 2AM to 6AM. One interesting part about the project was that the concrete work is all self-performed by JE Dunn, but the work was subcontracted out and bid against other subcontractors in the market. 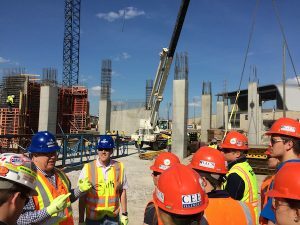 While walking through the site and observing the rebar and formwork assembly in progress for the first stage of the concrete structure, we also learned about the site-specific challenges faced by the construction team. The site is bordered on one side by a late 1800s/early 1900s building constructed of masonry and concrete. While excavating for the new building, the existing concrete and hard rock foundation was undermined, struck with a backhoe and broke loose. A structural engineer was brought out to evaluate the building and ensure that the structure was safe to occupy. The foundations also required some continuous pours that could not be halted, a challenge on a tightly compacted site, including a 1100 CY elevator pit. 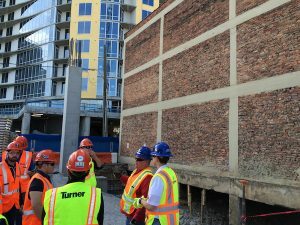 The team also wanted to point out the electrical vault that was also adjacent to this historic structure and the public street, requiring an innovative multi-piece trench box to construct in order to not impact the surrounding building and cause further complications. 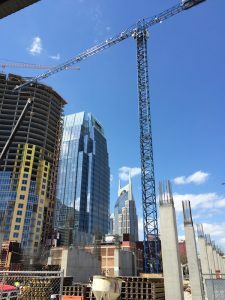 Visiting JE Dunn gave GLCM a unique view of not only the company but the Nashville and southern United States construction market. We were all able to learn a lot about the differences in construction methods and attitudes compared to our frame of reference. For our last full night in Nashville, some of the GLCM team decided to investigate the Nashville hot chicken craze and explore more of the vibrant downtown area.